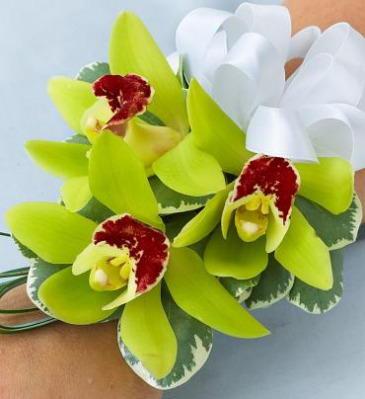 Add class and elegance to any occassion with a green Cymbidium orchid, both accented with fresh bear grass, our truly original corsage makes looking fashionable a breeze. 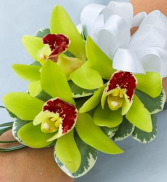 Price #1 is for a Single Cymbidium orchid; Price #2 is for a Double Cymbidium orchid; & Price #3 is for the Triple Cymbidium orchid as shown. 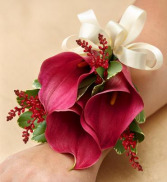 Crisp burgundy mini calla lilies with pink astible and variegated pittosporum are bound with white ribbon to create a charming hand-crafted corsage inspired by the colors found in the heart of wine country. Whether worn on the wrist or elegantly pinned, it’s hand-designed by our designers and ready to add a beautiful touch to any special day. 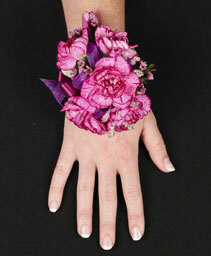 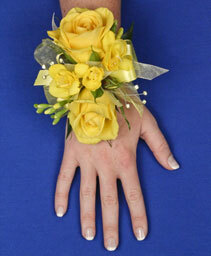 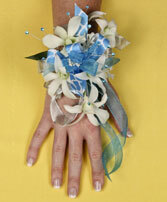 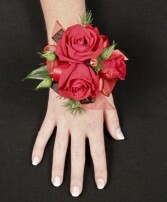 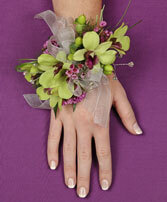 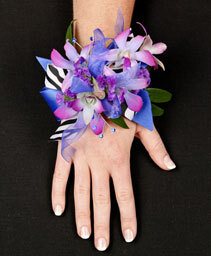 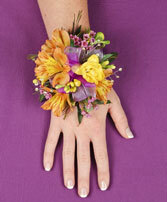 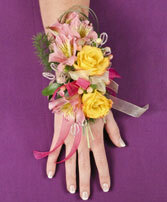 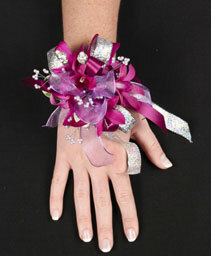 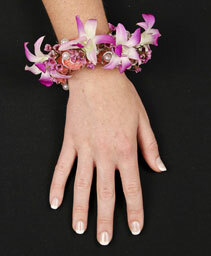 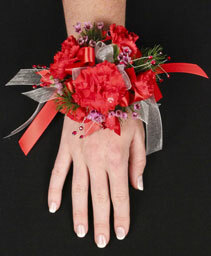 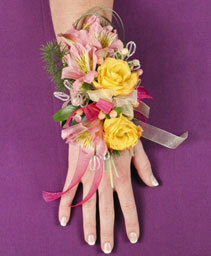 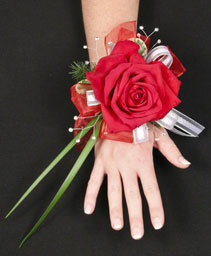 Filled with rustic charm, our country-inspired corsages are designed to deliver smiles. Artfully crafted by our florists with fresh sunflowers and freesia, they'll add the perfect pop of color for proms, weddings or any special occasion. 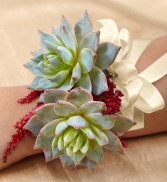 Fresh-cut succulents with pink astible are bound with white ribbon and accented with variegated pittosporum to create a charming hand-crafted corsage inspired by the colors found in the heart of wine country. Whether worn on the wrist or elegantly pinned, it’s hand-designed by our designers and ready to add a beautiful touch to any special day. 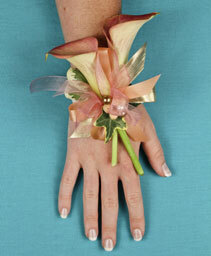 Filled with rustic charm, our country-inspired corsages are designed to deliver smiles. 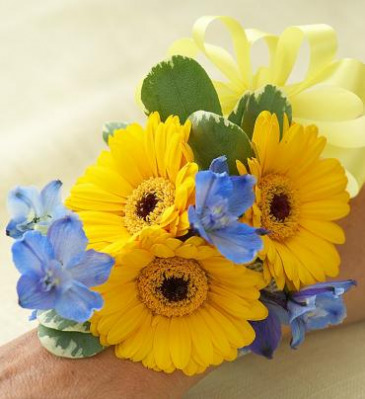 Artfully crafted by one of our designers with cheerful mini Gerberas and delphinium, they'll add the perfect pop of color for proms, weddings or any special occasion. 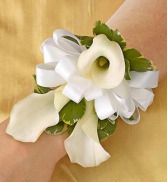 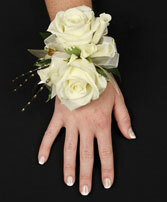 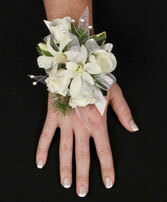 Crisp white Calla lilies, white roses and variegated pittosporum trimmed in white ribbon creates a look of memorable charm in this hand-crafted corsage. It makes an elegant accompaniment for any occasion. 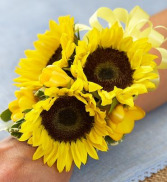 To make a special celebration truly unforgettable, it's important to remember every last detail counts. 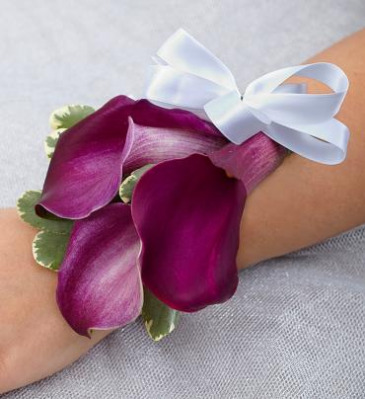 That's why our designers have created this charming corsage of crisp purple Calla lilies, accented with variegated pittosporum and hand-tied with white ribbon. Whether worn on the wrist or elegantly pinned, it’s a great way to enjoy your moment in the spotlight. 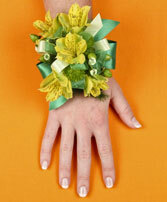 Different colors options are available, simply call the shop to discuss colors.